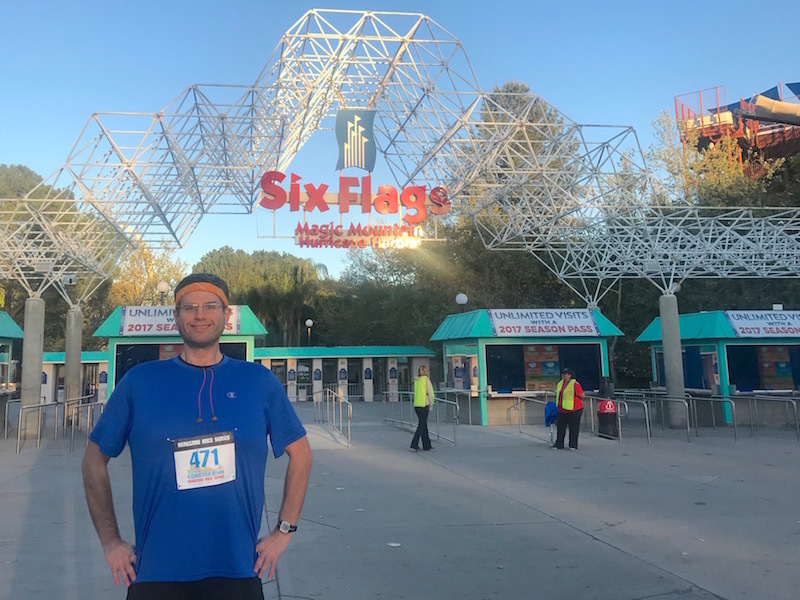 Running Among the Giants (Coaster Run 10K Race Recap) | Keep It Up, David! I’ve competed in four stair races in the past five weeks. I have two more scheduled in April. I need another race like a hole in my head, right? Wrong. I recently heard about a race that was too good to pass up, happening at one of my favorite places. I hate when my bib is crooked! SIX FLAGS! 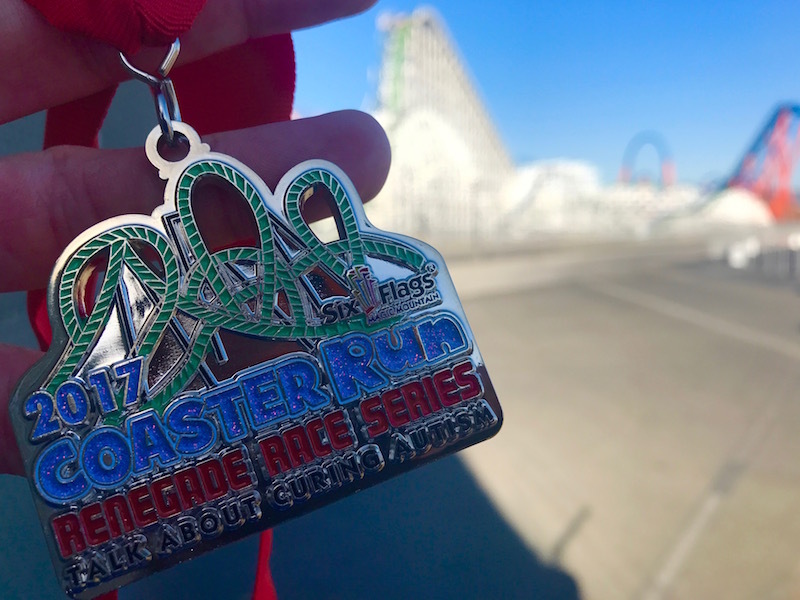 It’s called the Coaster Run, and you can do either a 5K or a 10K. 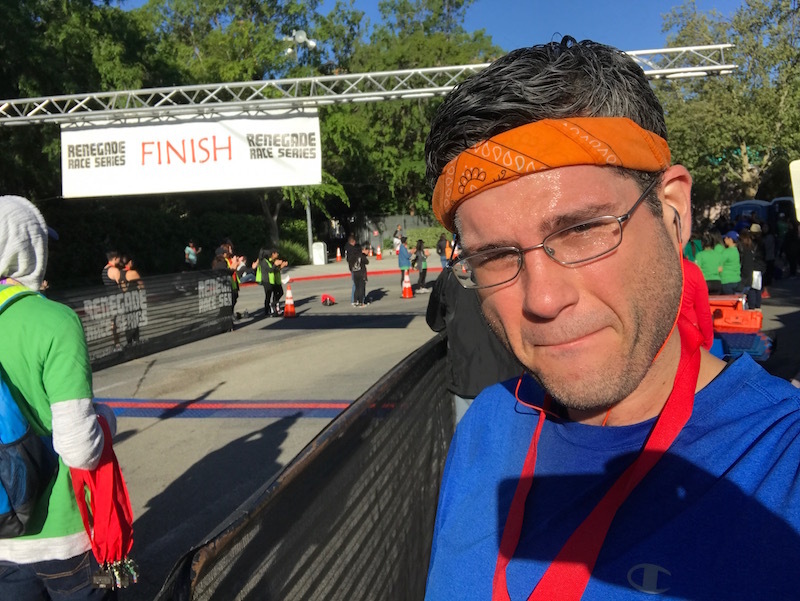 Although I’ve been going strong on the stairs, I haven’t been running much lately – only twice in March (one of which was an epic adventure that I still brag about). Even so, my general fitness is pretty strong right now, so I signed up for the 10K. It wasn’t about the distance for me. It was about the course. The Coaster Run winds through a closed, empty amusement park. 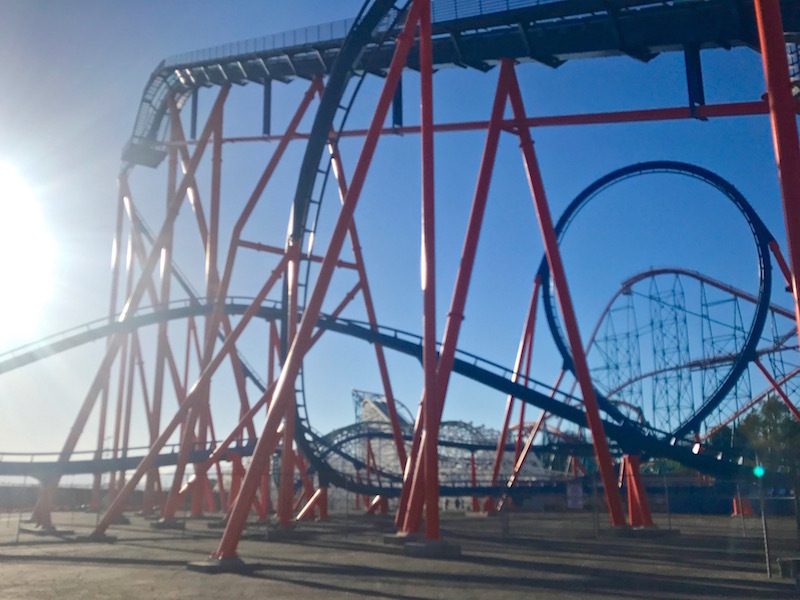 There are giant, silent roller coasters everywhere you look, looming overhead and casting shadows in the early morning light. I love roller coasters, and even though I haven’t run a 10K race since last summer in Michigan, I couldn’t say no to Magic Mountain. The race began at 7am, hours before the park opened for the day. 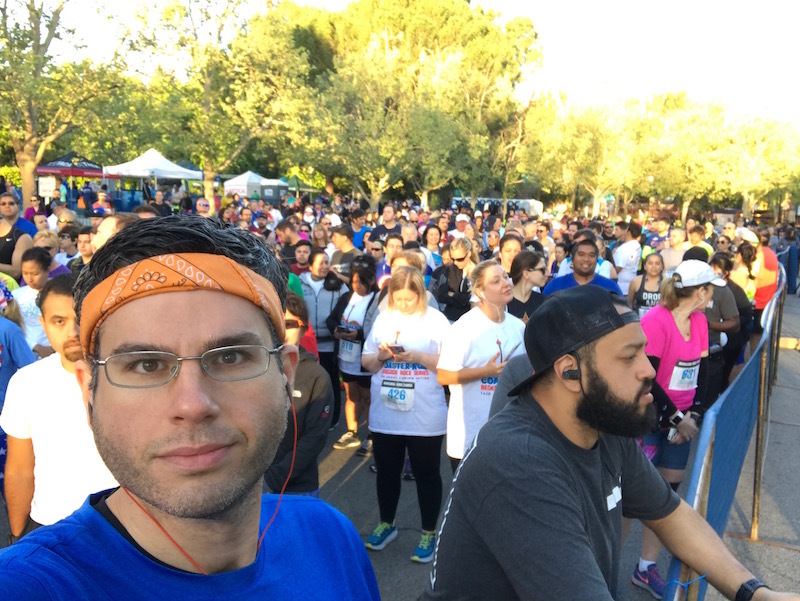 There were around 200 people doing the 10K, and I positioned myself near the front of the pack. A race through an amusement park is a lot different than other races. Instead of water stations, they pass out funnel cakes. To pick up your medal, you have to toss a ring around a goldfish bowl. And you have to wait 1-2 hours before you get to do anything. OK, OK, that entire paragraph was a lie. But it’s still pretty fun, and very unique. The start line was right outside the main entrance, and the route began with a loop around part of the enormous parking lot. Then we entered, running through the ticket booths, and looped through Hurricane Harbor, the water park. It hasn’t opened yet for the season, so it was kinda eerie running alongside slides, a lazy river, and a wave pool that were all empty. 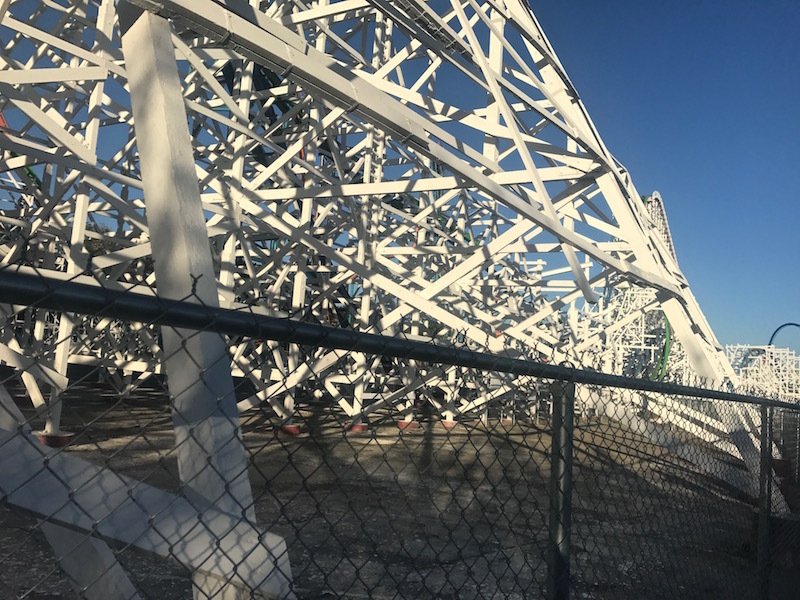 From there, we turned onto an access path that isn’t open to the public, and ran alongside Twisted Colossus, a fantastic wooden coaster at the edge of the park. We were just a few feet from the base of a forest of wooden supports, and I loved every second of it. As much as I loved running alongside a coaster, I loved running underneath one even more. And the route took us underneath Scream, dodging angled steel columns, some of which reached over 150 feet in the air. A little blurry, but not too bad, considering I took it while running. At one point we ran directly underneath Scream’s lift hill. So cool! Just getting access to these parts of the park, which are otherwise off-limits, made this race worth it for me. Then back out to the parking lot. We ran around the entire thing, and it’s huge. We even ran on an access road that circled the overflow parking lot, which isn’t even paved, and did a loop around employee parking in the very back. At one point we were so far away from the park that it looked distant and quaint. After running all the way back, we re-entered the park and continued along the back side. At one point we ran all the way around a pizza stand. (Earlier, we ran all the way around a Jelly Belly store.) There were a few geese wandering around, and one honked at me as I ran by. I’m too fast for you, goose! I know Magic Mountain pretty well. The parking lot is flat as can be, but the park itself has gentle hills and undulations. I was ready for the one notable hill on the route, up over a ridge by Roarin’ Rapids and Tatsu. The hill was probably about 1 kilometer from the finish line, and I blasted up it, grateful the entire time for all my stair training. It was on the hill that I passed a guy that I had been tailing the entire time, and broke away from another guy that had been tailing me the entire time. After coming down the hill, there was just a few more turns and weaves before exciting the park and crossing the finish line in the plaza out front. The medal is fantastic. There’s a coaster on it! Best of all, though, was that I continued to redefine my relationship with amusement parks. Despite my love for coasters, I spent a big part of my life avoiding them, because I was too fat to ride – and had an humiliating experience getting kicked off one. 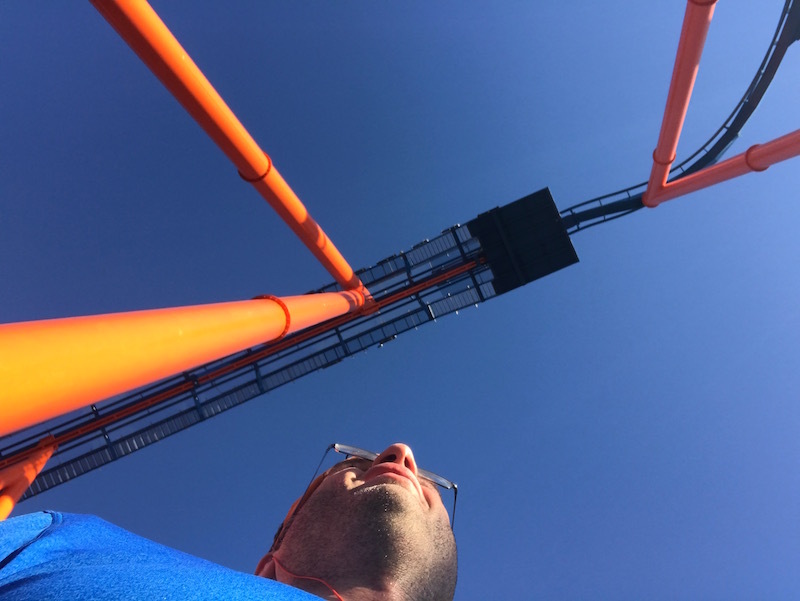 One of the incentives/rewards I gave myself when I was losing weight in 2010 was a trip to Six Flags, and that visit – my first coaster ride in a dozen years – was the subject of my very first blog post. Since then, I’ve blogged about theme parks a bunch. 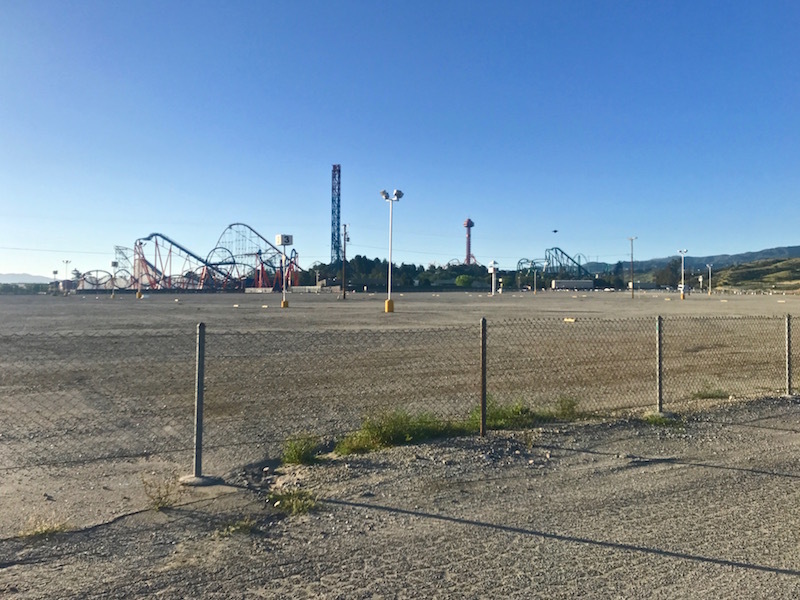 I’ve gone back to the park where I was humiliated to ride that coaster in triumph, and written about visits to Knott’s Berry Farm, Great America, and even a giant coaster in the middle of the Nevada desert. And now I’ve turned a new page. Amusement parks have a new meaning in my life. They’ve brought me shame, and they’ve brought me happiness, and now, with this race, they’ve provided me a venue to prove how far I’ve come in the past seven years. And that’s just as thrilling as the coasters I ran alongside. Maybe even more thrilling. This entry was posted on Monday, April 3rd, 2017 at 12:04 am and is filed under Uncategorized. You can follow any responses to this entry through the RSS 2.0 feed. You can leave a response, or trackback from your own site. It was a pleasure meeting you at the Coaster Run! Likewise, Kristin! Thanks for saying hello. Hope you had fun! I did! I hadn’t been to Magic Mountain since I was a teenager, so it was great to see it that way. Then we spent a few hours after riding coasters. I had to say hello. I feel like I know you since I have been following your blog for a while now. You are very inspiring. Glad you got to stay and ride some rides! I had other things to do, but I’m going back soon. And thank you for the kind words!